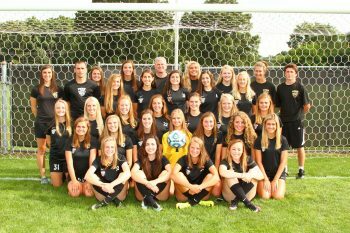 Coach Jeff Hart’s Penn Girls Soccer team, ranked No. 4 nationally, won its fifth game in six days, defeating Mishawaka 9-0 on Wednesday, Aug. 24. Four of Penn’s victories in that span have been against state-ranked opponents. Florida State recruit Kristina Lynch led the Kingsmen charge with two goals and two assists. She now has eight goals this season. Brooke VanDyck scored her first two goals of the season. She has six assists in five games. Sommer Domal and Kaitlin Paul shared the shutout in goal. It was the third shutout of the season for Domal. Paul, a sophomore, made her varsity debut. “Our coaching staff is very happy with tonight’s all around performance,” Coach Hart said. “We came out and scored five goals in the first 15 minutes and were able to rest a few girls who played major minutes over the weekend and Monday night.